In March, an animal shelter in Highland, Calif., discovered 34 German shepherd mix dogs found abandoned in a home. Animal control officials were called to the location, left a citation for the owner who never contacted animal control, and the dogs were removed. Authorities said the dogs appeared to be fed and in good condition but weren’t being taken care of when animal control officials arrived and were matted and filthy. One was pregnant. All the dogs were taken to Devore Animal Shelter in San Bernardino, Calif.; hopefully, each will find its forever home. Fifty-five dogs were removed from an old white farmhouse northeast of Chesterton, Ind., in what police in that area said was one of the worst cases of animal hoarding they’ve seen. Most people are aware of the phenomenon of animal hoarding, especially those in the business of rescuing animals. The Highland Park case illustrated above is just one of what some researchers and officials estimate reach into the thousands each year (approximately between 700 and 2,000) in the U.S., with approximately 250,000 animal victims annually. An animal hoarder crosses age, cultural, ethnic, socioeconomic and gender barriers, and is defined as someone who accumulates a large number of animals; fails to provide minimal standards of nutrition, sanitation and veterinary care; and fails to act on the deteriorating condition of the animals (including disease, starvation and even death) or the environment (severely overcrowded and unsanitary conditions), or the negative impact of the collection on their own health and well-being. Despite the fact that psychiatric help is necessary, little research exists on the topic. Further, animal hoarding in itself is not recognized in the Diagnostic and Statistical Manual of Mental Disorders, the psychiatric industry standard that offers common language and standard criteria for the classification of mental disorders. In the early 1980s, two researchers, D. Worth and A.M. Beck, interviewed multiple pet owners identified from files within the New York City department of health and animal control agency and from their own personal acquaintance. Most of those studied collected dogs or cats, men more often collected dogs, and women more often collected cats. Nearly two-thirds of their sample were women, and 70 percent were unmarried. Most participants reported their collecting started in childhood. In 1999, another researcher, G. J. Patronek, surveyed animal shelter operators about their experiences with people who hoard animals. In 54 cases, Patronek found that 76 percent of cases involved women, 46 percent of whom were 60 years of age or older; most were single, divorced or widowed; and almost 50 percent lived alone. 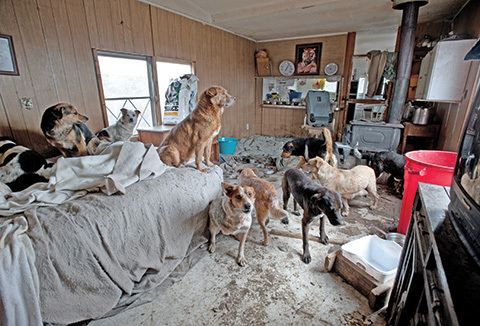 For many hoarders, animals act as stable, loving “fixtures” in a life clouded by a childhood of abuse or neglect, or extreme family instability. These vulnerable individuals transfer their feelings and attachments to emotionally safe animals. Underlying mental health issues, such as anxiety, paranoia, delusional disorder, attachment disorder, addiction, obsessive-compulsive disorder (OCD) and even dementia can be a root cause. Some think they have an affinity for communicating or empathizing with animals, and it’s their life mission to understand and care for them. Others have issues with maintaining control over their possessions. Worth and Beck believe that hoarders adopt a parental role toward their animals. Many hoarders claimed their animals gave them “unquestioning and uncritical love.” They tended to personalize and anthropomorphize their pets and view themselves as rescuers of suffering or unloved animals. According to Patronek, a common characteristic of people who hoard animals is the unshakable belief they are providing love and proper care. Further, say experts, hoarders avoid the unpleasant facts of their lifestyle. “Denial is very common and also something we see with other addictive behaviors,” said Dr. Randall Lockwood, a member of the American Society for the Prevention of Cruelty to Animals and the senior vice president of their Forensic Sciences and Anti-Cruelty projects. “A huge part of animal hoarding is related to how people define themselves, and one of the important things we have to do when confronting hoarders is recognize how important their feeling that they are somehow rescuing or helping animals is. What seems obvious common sense to most is exactly the opposite for others. Animal hoarding is extremely complicated. At any rate, Lockwood said, cases of animal hoarding are increasing. Families, friends and neighbors of animal hoarders, usually the first to realize the escalating severity of a problem, seldom know exactly how to handle such a situation. As complicated and heartbreaking as it is for those close to an animal hoarder, experts say that early intervention is key. Report the situation to local authorities, who also can guide families toward psychiatric care professionals trained to help individuals who hoard and identify underlying causes. As anyone who watches episodes of “Intervention” or “Hoarders” knows, the process is extremely difficult and never ending—it’s a disease that requires vigilance and management. However, to begin addressing the problem and preventing further neglect, suffering, disease, unwanted litters and death in animals, animal control, local law enforcement or the department of health must be made aware.